Description: Sexes similar. 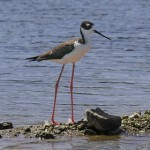 Very long gray legs and long upcurved bill are distinctive. 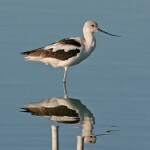 Breeding plumage shows cinnamon colored head and neck, gray in winter plumage. Wings and back have a black and white pattern. Juveniles have cinnamon wash on head and neck. Habitat: Found in ponds and marshes with sparsely vegetated shorelines. Nests placed on mudflats, sand bars and islands with little or no cover. Where in Nebraska: Common regular spring and fall migrant west and central, rare east. Common, locally abundant, regular breeder west and north-central, rare casual elsewhere. 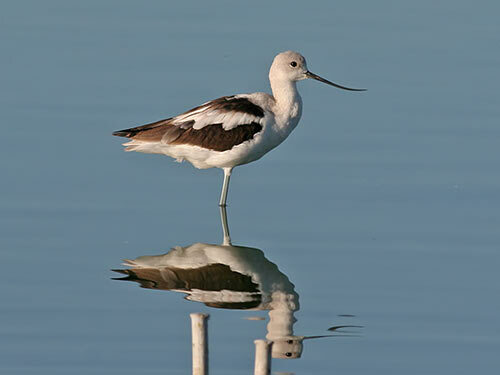 Fun Facts: American Avocets have a “recurved” bill, meaning the bill curves upward rather than downward.